DONEGAL farmer Shaun McFadden is smiling this week after scooping €30,000 including a holiday to Prague in Saturday's Winning Streak gameshow. Shaun (34) from Ramelton, moved to Letterkenny last year when he married Olivia (40). He continues to run the family farm since his father Fransie retired, and in his spare time volunteers for Ray Community Group which built a community centre in the local area. Shaun, who has a twin sister Sinead and three other siblings, also plays right back for Whitestrand United in Division 2. He purchased his lucky scratch card in O'Neill's of Bridgend. 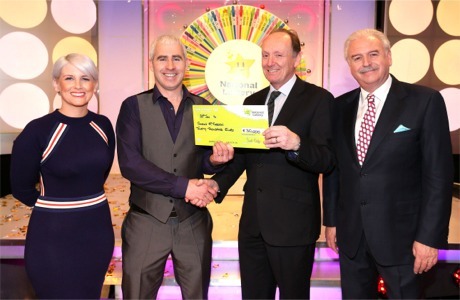 He is pictured here with gameshow co-host Sinead Kennedy; Declan Harrington of the National Lottery and co-host Marty Whelan.